2) Who ran the NYC 2009 marathon yesterday? First off I have to apologize because I have been slacking in getting this ezine to you. But I am using my writing difficulties over the summer as a lesson to learn from and share with you in the same way I do with my running. You see, my baby is at that stage where he likes to run around and destroy things (I am typing with a keyboard that has 6 missing keys!). But after some schedule readjustments, finally admitting to hubby and even some friends that I need a little help with babysitting now and then and many inspiring emails from you, the readers of running-mom.com which have reassured me that this site is not going unread and it is actually helping some of you! wooohooo!, my ezine is back and better than ever. I have interviews with some very inspiring moms laid out including moms who have completed their first marathon this year, moms who have trained having to push multiple kids in the jogger at once, moms who gear up in the cold winter and one mom who is training for a 100-mile ultra marathon this winter! 2) Who ran the ING NYC 2009 marathon yesterday? So instead, we watched it on the TV together. I started crying as soon as the first runner crossed the start line and E-man, having learned to cheer for every runner since he was a few months old, started clapping and shouting yay!!! And the next thing I did was start thinking of a marathon in the spring that I could sign up for, you know what I'm talking about, that feeling of watching other runners and feeling like you just need to get out there and run! Well congratulations to those of you who were out there running the NYC marathon yesterday, or who ran your first, second...maybe even your tenth or twentieth marathon this fall. Congratulations to all you running mamas that got out there and ran your first run, your first race, whatever running goals you accomplished over the summer, a big congratulations to you! 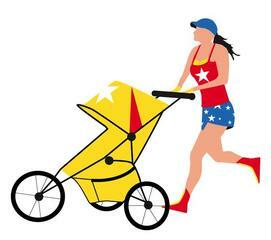 And please share your experience with us so that you can inspire other running moms! Remember, there is someone that will relate to you whether you ran you first mile this summer, completed a marathon, or whether you are training for yet another big race and trying to get a PR. You can share your running stories here. Now here are some of new pages I have really enjoyed adding to running-mom.com and I think you will enjoy reading them. With the cold weather coming in now, how do you stay in shape throughut the winter? Do you still run outdoors? Are you looking for some other way to stay in shape until Spring comes back? Here are some tips on running on the treadmill. Are you finding that it is difficult losing or even maintaining your current weight while running? Or maybe you are looking to lose weight doing something you enjoy? Afterall, from my experience, that is the only way to lose weight, doing something you enjoy that is! Well in my fourth year of running, I have finally figured out how to lose weight running. Read here what I did to lose twenty pounds this year. That included the last ten pounds of baby weight and the extra ten pounds I was trying to get rid of before I even got pregnant, you know those last ten stubborn pounds that won't budge. So here are my tips on how to lose weight running. It has really helped me increase my running speed. I am especially excited about this page because it is the whole reason I started running-mom.com and it only took me one year and five months to build. But I have already gotten an amazing amount of feedback and helpful reviews from you all. So now I give to you... The Running Bra Reviews! Do you have a funny story running story? Or maybe you struggled throughout the summer trying to figure out why you run and then one day you got out there and had a great run and remembered once more what it is you love about running? Or maybe you are still struggling? Or maybe you finally got that PR you've been working so hard for and you're just beaming about it and want to share it with other running moms. Share your running story here. One place that is becoming popular on this site is the pregnant runners page. Here are some pregnant runners' stories.